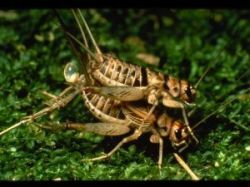 Top-of-the-line crickets used in China's notorious prize fights always have a nice romp in the sheets pre-battle, the Los Angeles Times reported. Sold for the US equivalent of about $10,000, the little insects are fed lots of veggies and calcium supplements, and always get their jollies off before taking to the ring. And I always thought pent-up sexual energy was the chief cause of fights.